The last time FC Halifax Town were promoted into the National League, they almost made it straight out of the other side. But not even the most optimistic Town fan is surely expecting a repeat of the miraculous play-off finish that Neil Aspin’s men secured in 2014. That side featured Lee Gregory, Marc Roberts, James Bolton, Matty Pearson and, for half a season, Dan Gardner, all of whom have gone on to play in the Football League. That fate could still await more of Town’s current crop - with Jordan Sinnott having departed to Chesterfield - but while Gregory was an obvious star in Aspin’s 2013-14 team, Billy Heath’s squad is more of a collective unit, stronger than the sum of its parts. Gregory’s 32 goals were a major factor in Town’s top-five finish under Aspin, whereas Heath’s group don’t appear to have anyone that could match that staggering figure, so may be reliant on a more collaborative approach. Only five players remain from the squad that went down from the Conference just over 12 months ago - Scott McManus, Josh Macdonald, Sam Johnson, Matty Brown and Jake Hibbs - but crucial to Town’s success or failure will be how much the league has moved on since they were last in it. Leyton Orient and Hartlepool both drop down from League Two with a £750,000 parachute payment, while Tranmere had an average attendance of more than 5,000 last season, with Wrexham’s just under 4,000; they might be in the same division but they’re in a different league to Halifax. The likes of Eastleigh, Dagenham and Redbridge, Fylde, Aldershot and Aspin’s Gateshead also probably fall into the category of the haves rather than the have-nots. It could be the games against clubs expected to struggle, such as Guiseley, Solihull Moors, Chester, Maidenhead and Boreham Wood, that prove decisive. Heath’s squad proved last season they have the bottle and the temperament to handle big occasions, but those games will come round every week now they’re in exalted company. Their effervescent performances against Eastleigh and Dagenham in the FA Cup last season also bode well. Halifax were simply far too generous at the back the last time they were at this level, conceding 86 goals, more than any other team, as they were relegated. But defence is arguably their strongest area this time round, with last year’s player of the season Scott Garner, a hopefully-fit Matty Brown and Wrexham’s 2016-17 player of the season Martin Riley. Plus goalkeeper Sam Johnson is probably Town’s star signing after two highly-impressive loan spells with the club and should only improve with regular football against higher-league opposition; he’ll certainly be busy this season. However, the calm head and consistency of captain Kevin Roberts is a big loss on and off the pitch. Further forward, Adam Morgan has the ability to take the league by storm if he can perform to his consistent best, while Tom Denton will continue to be crucial at set-pieces in both boxes and will score goals again, the only question is how many. In Dion Charles, Matty Kosylo and Connor Oliver, The Shaymen undoubtedly have the creativity to carve out chances. But there is arguably a question mark over how many of those will be converted regularly. Heath and assistant boss Mark Carroll have made a career out of upsetting the odds and have waited 17 years for the opportunity to manage at the highest level in non-league. 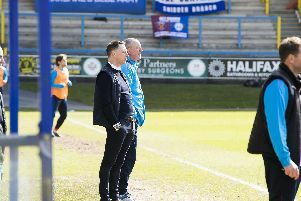 They rejected the chance to manage North Ferriby at this level a year ago, instead opting to take one step back with Halifax to then try and make two steps forward. The duo were aware of Ferriby’s limitations at National League level, and were proved right when they finished bottom of the table last season. But they didn’t join Halifax to finish bottom of the table. A repeat of Aspin’s play-off push is unlikely, to say the least, but being able to survive and prosper at this level represents a realistic and achievable aim.